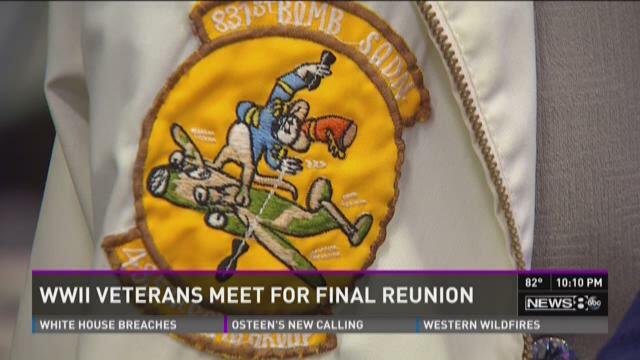 The last surviving members of the 485th Bomb Group met in Dallas on September 21, 2014. "We chose to celebrate, because that's the kind of group we are." DALLAS — It was a bittersweet celebration for World War II veterans. The 50th reunion of the 485th Bomb Group of the Fifteenth Air Force took place in Dallas the weekend, but only about 25 of the former servicemen — along with their families and friends — were able to attend. All are now over the age of 90. Many of their fellow servicemen can no longer travel, and this is expected to be their final reunion. "We had to make a decision to go down to the last man standing, or try to have a party for those who are still with us," explained 485th Bomb Group historian Jerry Whiting. "We chose to celebrate, because that's the kind of group we are." This is probably the last chance for 90-year-old former pilot Bueford Cooper to thank 94-year-old Robert Friend, whom he had never met before this weekend. "He flew fighter cover for me on bombing runs in southern Germany and in that southern area during World War II," Cooper explained. "He probably saved my life during more than one occasion." Historically, this group holds a special place as one of the first to informally "integrate" with the Tuskegee Airmen — known as the Red Tails. The Bomb Group landed and stayed at the Red Tails air base in Italy for five days during World War II. Back then, white servicemen rarely socialized with black servicemen. These veterans remember their interactions five decades ago with pride. It is their history they all hope Americans will never forget — long after this greatest generation is gone.